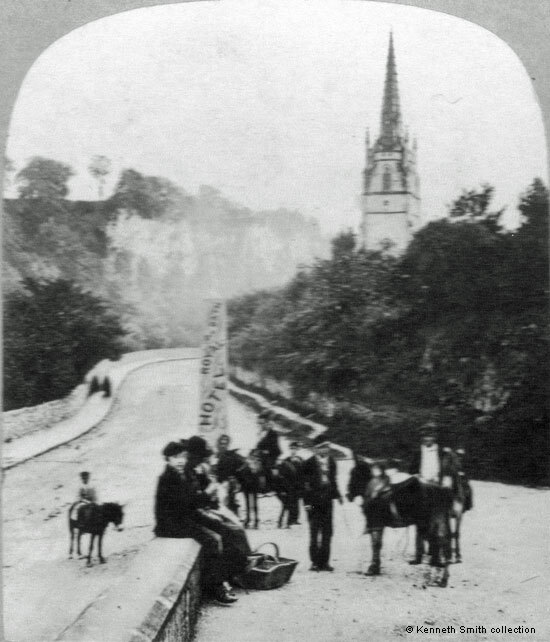 Donkey rides were a good way of visiting such places as the Heights of Abraham for those who did not want to walk up the hill in the nineteenth century. William Adam, writing in 1840, tells us that the hourly hire rate was one shilling. Over the years there were complaints about donkey nuisance and the issue was sometimes discussed by Matlock Bath and Scarthin Nick Local Board. One disgruntled visitor to Matlock Bath wrote to the Derby Mercury in the summer of 1866, during a particularly hot week. He began by objecting to the state of the roads: "Whilst taking my daily walks through this place during the past hot week (which, if I could have done so in peace and comfort, would have been delightful,) I have been almost blinded with dust". He went on to complain about the donkeys, the cabbies and the donkey urchins : "but who would imagine, to see the utmost disorder amongst the cabs and the unfortunate quadrupeds in Matlock Bath, there was in existence anything approaching a restraint of any description. Instead of being quietly stationed upon their "stands", they are allowed to move about plying for hire, and a most intolerable nuisance exists in the confusion and quarrelling prevalent among the "Cabbies," and donkey urchins, as to who should "take you to the Via Gellia, the Black Rocks, sir; take you cheaper than any of 'em, sir"". This stereoview shows mostly youngish boys, the donkey urchins who had upset the complainant, waiting for passing trade by the obelisk below the Royal Hotel. You can almost hear them calling out the words. They may have been a nuisance to some, but they needed the work whilst they could get it to supplement the family income. The tourist season was very short. Croston, in 1868, described an area nearby as being the "general rendezvous of the ostlers, stable-helpers, donkey drivers, guides", etc. He also mentioned the donkeys and their treatment at the hands of some local lads. The donkey issue resurfaced in 1888 when Matlock Police Court dealt with a case involving badly behaved donkeys on 25th July. James Rouse, of Matlock Bath, was charged on the 7th July with having donkeys on the highway and not keeping them under control. Police Inspector Faulkner told the court that he had seen "four donkeys galloping along the Bath as fast as they could go. [The] Defendant was riding upon one of the animals. The police said they had many complaints about these donkeys, and they were constantly getting into trouble. Rouse was fined 1s and 10s. 6d costs". The words Royal Old Bath Hotel can clearly be seen painted on the obelisk. Today the Temple Hotel's name has been carved into the stone. Cat Tor, then known as Wild Cat Tor, is the spectacular limestone rock face in the background and the church spire belongs to Holy Trinity Church. 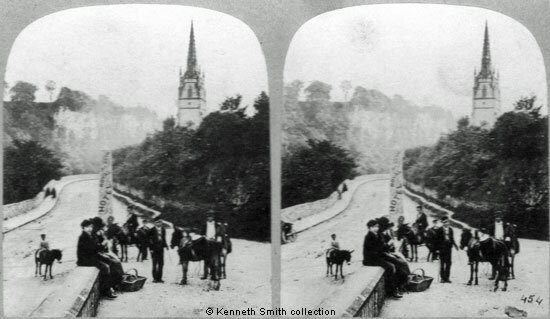 Stereoview "Matlock Bath, Derbyshire", no.454, from the collection and © Ken Smith. "Derby Mercury", September 13, 1865. At the Local Board Meeting of 30th August, held at the Literary Institute, the issue of donkey nuisance was on the agenda, but it was said to have abated. "Derby Mercury", 4 July 1866. "Derbyshire Times", 28 July 1888.